New and interesting products and gear for pilots. 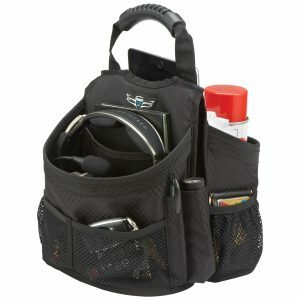 This compact carrying case from Sporty’s provides an easy way to organize all of your flight gear and keep it within reach during your trip. The case splits down the middle and features a large top handle, allowing it to drape over a seat or other divider. The case is equipped with several large mesh pockets on each side for easy storage. It also features a dedicated pen holder and flashlight holder. The case is just shy of 1 foot long in height, width and length, making it a good option for a tight-fit cockpit. The bag is priced at $34.95.